The Peter F. Yacht Club writing group, if you can even call it a proper group, came out of informal gatherings that occasionally became a bit more formal, before dissolving altogether, starting four or five years before the first issue of The Peter F. Yacht Club appeared in August, 2003 (accidentally ten years to the month after above/ground press’ first official publication). Does a group even still exist? It does, but as a scattering of social interactions and individual connections, but for the pages of the publication itself, over a dozen issues long. By the mid-1990s, into the adjacent years, Ottawa writing seemed in flux; Rob Manery and Louis Cabri, so active through the previous decade, had left, taking hole magazine, hole books, Manx’s N400 Reading Series and The Transparency Machine with them, in 1994 and 96, respectively. Toronto’s jwcurry landed in 1996, but was still on the sidelines; the writers festival had been invented, but its true influence hadn’t quite solidified. Stephanie Bolster arrived in 1995 from Burnaby, published a first book in 1998, won the Governor General’s Award and, by 2000, had left for Montreal, to teach at Concordia. On January 1, 1999, b stephen harding and I formally handed over Ottawa’s TREE Reading Series, the third longest continuing reading series in Canada, to others, thus ending two and four-and-a-half year long tenures, respectively. Christopher Levenson ran his Ottawa Poetry Group in one direction, clinging to a set of fixed formal ideas, and where were the rest of us to turn? William Hawkins and Michael Dennis, once enormously active in the 1960s and 1970s and 80s, respectively, in and around the Ottawa literary communities, skimmed the margins, well back from publishing and public events. John Newlove as well, head down in his daily paths between home, work and Patrick McGahern’s Books. There were first poetry collections by myself, David O’Meara, Michelle Desbarats, Ian Roy; return to a life of poetry by former Montrealer Stephen Brockwell after nearly a decade, and Monty Reid had quietly arrived from Drumheller, landing in Luskville, Quebec, but had not really let any of us know about it, yet. After degrees at the University of Victoria and University of Alberta, Mark Robertson had returned after an Ottawa hiatus with a new energy, a stack of writing and a new moniker, Max Middle. Within a couple years of publication, two-thirds of the nine writers included in Shadowy Technicians: New Ottawa Poets (Fredericton NB: Broken Jaw Press, 2000) had moved away, or simply vanished. This was not any engine by which to sustain a community. Originally, my idea for regular meetings was a kind of informal sharing of writing, a support group, in this odd thing we did, writing poems and sending them out to journals. Could spouses, partners, parents, co-workers really understand? The first meetings were disorganized, rambling events at my shared house at 96 Rochester Street attended by b stephen harding, Clare Latremouille (who had only recently returned from a decade around British Columbia), Stephen Brockwell, Anita Dolman, James Moran, jwcurry, Jennifer Mulligan and a sixteen-year-old Laurie Fuhr. Could Max Middle have been there as well? We read new work both finished and unfinished, talked about what we had recently sent out, had accepted, turned down; books we were working on. We drank too much, and stayed up far too late. Laurie looked afraid, but stayed. curry grumbled. Clare and I conspired. Eventually meetings also included Melanie Little and Peter Norman, recent arrivals from Vancouver, and Vivian Vavassis, who had arrived from London, by way of Western; or was it Montreal? It’s as though The Peter F. Yacht Club is more in line with what the 1970s Montreal group the Vehicule Poets were, a grouping of writers who originally formed through defining themselves and their group by what they weren’t. Seven Montreal poets, including Endre Farkas, Ken Norris and Artie Gold, who, for whatever else they accomplished, originally came together through not being a part of the poetic of such as Michael Harris and David Solway. One thing I’ve always found frustrating about any history of Ottawa literature, and poetry specifically, is a lack of continuity; once a group has dispersed and gone, it’s as though it never existed, and there’s very little in place to let you know it had even been. Do you remember Sparks? Oroboros? Northern Comfort? The Carleton Arts Review? Anthos magazine and Anthos Books? Back when Mark Frutkin and Riley Tench collaborated as sound poets. Were you aware of the infamous 24-hour poetry reading at SAW Gallery circa 1981 that included Robert Craig, Seymour Mayne, Patrick Lane and Lorna Crozier? Jane Jordan, who ran poetry readings at Pestelozzi College (Ottawa’s own Rochdale) in the early 1970s, or William Hawkins who ran readings and musical performance at his infamous Le Hibou, years before? That series of poetry cassettes produced by Gallery 101 in the 1980s, during the tenure of artistic director Dennis Tourbin, back when Ottawa still had a poet laureate? Once gone, they appear to be completely gone. You should have seen the stuff, for example, Gallery 101 and SAW Gallery were getting rid of during dumps of their archive. Three copies of the first edition of Michael Ondaatje’s The Collected Works of Billy the Kid (1970) for fifty cents each (considered a $600 book, at least) during one of their “garage sales,” left over from when he launched the collection in Ottawa the same year. Once I moved out of that shared house in 2001, more formal workshop conversations were held at Anita’s apartment on McLeod at Elgin Streets, and at Melanie and Peter’s on Bronson, a door or two south of the intersection at Somerset. It was in Anita’s lobby I first found the pair of purple pillows that currently adorn the back of my couch, decorated with The Peter F. Yacht Club logo emblazoned centre-squared on each. Where did these pillows come from? A recently-deceased resident of her building, and their belongings waiting for disposal in the lobby (I offered one to Anita, who politely returned it). As Clare asked at the time, what if it were the pillows that killed them? What the hell is the Peter F. Yacht Club, then? So far just us. Internet searches have so far come up cold. A support group. Created to achieve, at least, the support to continue. To have conversation about what we were doing, trying and reading. The movement of the group can be seen best through the pages of the publication itself, something I originally based on Vancouver’s TADS, an informal Friday night group that had each issue edited by a different member, moving through George Bowering, Jamie Reid and Jason Le Heup. Ours, it seems, have predominantly been edited/published by myself, but others have joined in as well, each with the guidelines of inviting all from the group, and able to put in some others that might appeal to them as well. Part of that appeal, Max Middle would certainly have a different group of outsiders than, say, Laurie Fuhr or Jesse Patrick Ferguson, and who wants a journal only to read yourself? Good conversations happen with a good foundation, and then it’s important to see who else might have a say. Issues were often distributed informally, with a couple of copies each to contributors, fifty more to the editor to disseminate as they saw fit. Another sixty to eighty were sent out to subscribers of above/ground press, not only scattered across Canada but into the United States, including library collections at Simon Fraser University and SUNY-Buffalo, with the occasional distribution point of the semi-annual ottawa small press book fair. The fourth issue was even produced in a run of five hundred copies for free distribution at the fall 2005 ottawa international writers festival, including writers scheduled to appear, such as George Bowering, Suzanne Buffam, Stephen Cain, Margaret Christakos and Susan Musgrave. Without regular meetings, the ongoing conversation of new writing continued through the open set of the TREE Reading Series, a place where many Ottawa writers over the past three decades often managed their first or second public readings, with regular open sets filled with much of the group, as well as other Ottawa writers—Shane Rhodes, David O’Meara, Michelle Desberats and Peter Richardson—an ongoing conversation that, at least in that form, unfortunately seems to have fallen by the wayside. [photo by John W. MacDonald] As issues progressed, other “regulars” were brought into the fold, including Amanda Earl, Marcus McCann, Pearl Pirie, Sandra Ridley, Nicholas Lea, Jesse Patrick Ferguson, Wanda O’Connor, Roland Prevost, Janice Tokar, Cameron Anstee, Monty Reid and Lainna Lane El Jabi. We even held a few launches, often held as “office Christmas parties” at the Carleton Tavern, Parkdale Market (and even an Edmonton launch, in the fall of 2007). 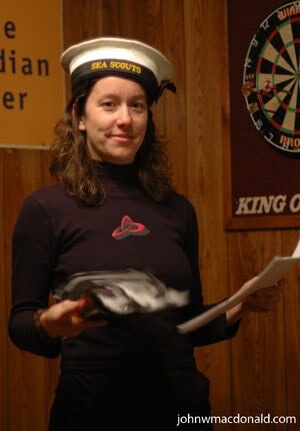 Keeping with our nautical theme, calling our launch reading “regattas,” one even included a captain’s hat. Still, part of the success of these initial connections have been in watching the evolution of the individual writers, and the inevitable offshoots, from Norman and Brockwell’s magnificent collaborative sonnet-essay, Wild Clover Honey and The Beehive, 28 Sonnets on the Sonnet (Ottawa ON: The Rideau Review Press, 2004), Norman and Fuhr’s voice-work with jwcurry, Max Middle’s AB Series, which has featured a number of Yacht Clubbers, Fuhr’s help in publishing more than a few in the pages of filling Station, eventual above/ground press publications by Brockwell, Dolman, Ridley, Earl, curry, Mulligan, Fuhr, Norman, Reid, Middle, Anstee, Lea, Ferguson, McCann, Pirie and Prevost, or even Mulligan and I founding Chaudiere Books, home to the work of a number of the same. A camaraderie, but one I admit to missing in person, now that so many have moved on: Peter and Melanie went west for her writer in residence position at the University of Calgary, then east and finally Toronto, where she is currently senior fiction editor at the House of Anansi Press and he, author of a first poetry collection and a forthcoming novel; Laurie moved west and west again, landing in Calgary, where she runs filling Station magazine; Wanda moved to Montreal to attend Concordia University; Jesse headed further to Fredericton, to the University of New Brunswick, publishing a first poetry collection as well; and James and Anita moved to the east end of Ottawa with their new-third, now a toddler. Who has any time? Issue #1, August 2003, edited by rob mclennan; 200 copies. Contributors: Stephen Brockwell, Anita Dolman, Laurie Fuhr, Clare Latremouille, Melanie Little, rob mclennan, James Moran, Peter Norman, Artie Gold, Suzanne Zelazo & Rob Budde. back cover image by Tom Fowler. Issue #2, April 2004, edited by Anita Dolman (out of print); 200 copies. Contributors: Stephen Brockwell, Anita Dolman, Laurie Fuhr, Melanie Little, rob mclennan, Max Middle, James Moran, Peter Norman, Vivian Vavassis, Wes Smiderle & Zachary Houle. Distributed free. Issue #3, October 2004, edited by Peter Norman and Melanie Little; 200 copies. Contributors: Stephen Brockwell, jwcurry, Anita Dolman, Laurie Fuhr, Clare Latremouille, Melanie Little, rob mclennan, Max Middle, James Moran, Peter Norman, Vivian Vavassis, Amanda Earl & Wanda O’Connor. Issue #4, September 2005, edited by rob mclennan; 500 copies. Contributors: George Bowering, Stephen Brockwell, Suzanne Buffam, Stephen Cain, Margaret Christakos, Anita Dolman, Gwendolyn Guth, William Hawkins, rob mclennan, Max Middle, James Moran, Jennifer Mulligan, Susan Musgrave, Wanda O'Connor, Sandra Ridley & Vivian Vavassis. Produced as a handout for the ottawa international writers festival, September/October 2005. Otherwise, sold for $5. two-by-two on that oversized lifeboat, A Peter F. Yacht Club special, December 2005, edited by rob mclennan; 200 copies. Contributors: Jesse Ferguson, Nicholas Lea, rob mclennan, Max Middle, Jennifer Mulligan & Monty Reid. produced "for the first ever Peter F. Yacht Club Christmas Party, Saturday December 17rh, 7:30pm until forever, at the Carleton Tavern, Parkdale Market, Ottawa (hosted by rob mclennan & Clare Latremouille). (thanks to Laurie Fuhr for providing an accidental title)." isbn 1-897224-10-9. Issue #5, April 2006, edited by Max Middle; 200 copies. Contributors: Gary Barwin, Anita Dolman, Jesse Ferguson, Laurie Fuhr, John Lavery, Nicholas Lea, rob mclennan, Max Middle, James Moran, Jennifer Mulligan, a. rawlings, Sandra Ridley, Vivian Vavassis & Rachel Zavitz. Issue #6 (mis-numbered Calgary special), February 2007, edited by Laurie Fuhr; 200 copies. Contributors: Jonathan Ball, Derek Beaulieu, Ryan Bird, Stephen Brockwell, Weyman Chan, Anita Dolman, Jesse Ferguson, ryan fitzpatrick, Richard Gorecki, Jocelyn Grosse, Joy Hendrickson-Turner, Nicholas Lea, Laurie Fuhr, Melanie Little, David McGimpsey, rob mclennan, Max Middle, James Moran, Tom Muir, Jennifer Mulligan, Peter Norman, Sharron Proulx-Turner, Stuart Ross, Wes Smiderle, Joanne Underwood, Vivian Vavassis, Yvonne Werkman & Garth Whelan. Issue #7, April 2007, edited by rob mclennan; 200 copies. Contributors: John Barton, George Bowering, Stephen Brockwell, Amanda Earl, Jesse Ferguson, Laurie Fuhr, Phil Hall, Nicolas Lea, Clare Latremouille, Marcus McCann, rob mclennan, Max Middle, Wanda O'Connor, Roland Prevost, Sandra Ridley & Wes Smiderle. Issue #9, January 2008, edited by Jesse Patrick Ferguson in “The Poets’ Corner” (Fredericton, New Brunswick), and produced at the University of Alberta; 200 copies. Contributors: derek beaulieu, Amanda Earl, Jesse Patrick Ferguson, Laurie Fuhr, Nicholas Lea, rob mclennan, Max Middle, Roland Prevost, Monty Reid & Hugh Thomas. Issue #10, March 2008, produced at the University of Alberta, edited by rob mclennan, “in by one, out by four” special; 200 copies. Contributors: Jeff Carpenter, Trisia Eddy, Lainna Lane (El Jabi) and rob mclennan. Issue #11, May 2008, “Edmonton issue the second,” produced at the University of Alberta, edited by rob mclennan; 200 copies. Contributors: Douglas Barbour, Jenna Butler, Amanda Earl, Jesse Patrick Ferguson, Laurie Fuhr, Lea Graham, William Hawkins, Karen Massey, Marcus McCann, rob mclennan, Max Middle, Sean Moreland, Jennifer Mulligan, Catherine Owen, Pearl Pirie, Roland Prevost, Wes Smiderle & Janice Tokar. Issue #12, September 2009, edited by Amanda Earl, “Fifth anniversary issue: Anarchy, Apocalypse, & Madness.” 200 copies Contributors: Stephen Brockwell, Anita Dolman, Amanda Earl, Jesse Patrick Ferguson, Marcus McCann, rob mclennan, Pearl Pirie, Roland Prevost, Monty Reid, Sandra Ridley, Janice Tokar, Christian S. Aluas, Cameron Anstee, Jamie Bradley, Caleb JW Brasset, Patrick Edwards-Dougherty, F.C. Estrella, Jose Fernandez, Warren Dean Fulton, John Gilles, Csaba Andras Kertész, Joseph Kuchar, Ben Ladouceur, Leopold, Stephen Rowntree & Robert Williams. Issue #13, July 2009, edited by rob mclennan, “lucky thirteen – the white album.” 200 copies Contributors: Cameron Anstee, Stephanie Bolster, Amanda Earl, Lea Graham, Gwendolyn Guth, Lainna Lane El Jabi, Marcus McCann, rob mclennan, Sean Moreland, Pearl Pirie, Roland Prevost, Monty Reid, Sandra Ridley and Janice Tokar. It's so nice to see the Captain's Log at last, rob. Thanks for the friendship & inspiration, ship-mate!